College basketball's flopping epidemic could be quickly curtailed if more coaches did what Louisville's Rick Pitino did Tuesday. 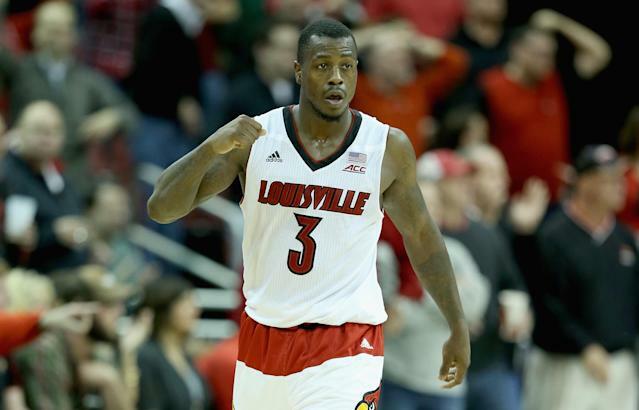 PItino benched starter Chris Jones against Long Beach State to send a message that he will not tolerate any more chicanery from the senior point guard. Jones made headlines nationwide three days earlier for a blatant flop early in the second half of Louisville's loss to rival Kentucky. When Kentucky's Dakari Johnson swung his elbows to try to clear space after securing a rebound, Jones flailed and fell to the ground as though he had been struck in the face. He continued the charade by getting up wincing and holding his jaw even though Johnson's elbow never so much as grazed him. The fallout from Jones' flop was swift as video spread quickly on social media. ESPN analyst Jay Bilas called it "embarrassing" during the broadcast, former Kentucky star DeMarcus Cousins poked fun at Jones on Twitter and a Kentucky fan even made a Claymation video of the incident. “I was very upset at that," Pitino told WDRB's Eric Crawford after the game. "We don't do that type of thing. And then to fake it with the jaw like you got hit. You can't fake it. In junior college you do it. But you can't fake it. It's on TV. You can't fake those things. So I told him, you're not playing because of that. That's something Louisville guys don't do." Cynics will note that Jones' benching came against a small-conference opponent and also followed a 3-of-15 shooting performance, but Pitino insisted his point guard's season-long 30.8 shooting percentage had nothing to do with the lineup switch. Freshman Shaqquan Aaron started in place of Jones, who did not attempt a shot in nine minutes off the bench. Regardless of Pitino's rationale, simply publicly admonishing Jones is more than most coaches have done in similar situations. Oklahoma State coach Travis Ford defended Marcus Smart over and over last season even though the standout guard earned such a reputation for flopping and diving that rival fan bases started bringing homemade "flop counters" to games. Jones, for what it's worth, was contrite after the game. He told reporters in Louisville that he sometimes tried to anticipate contact during junior college in hopes of either lessening the blow from an elbow or drawing a foul, but he knows he can't do that anymore. Message sent by Pitino. Message received by Jones. Now we'll see if any other programs follow suit.